Of the authors whose books were burnt by the University of Oxford in 1683, none were named and cited for their ‘damnable doctrines’ against State and Government as frequently as the nonconformist divine Richard Baxter. His troubles with the censors did not begin with that summer conflagration, nor did they end there: just two years later he was tried and imprisoned for his Paraphrase on the New Testament. Despite Baxter’s protestations to the contrary, Lord Chief Justice Jefferies described the Paraphrase as a ‘scandalous and seditious book against the government’. Indeed, Baxter’s life since the Restoration was one over which censorship had a profound influence. 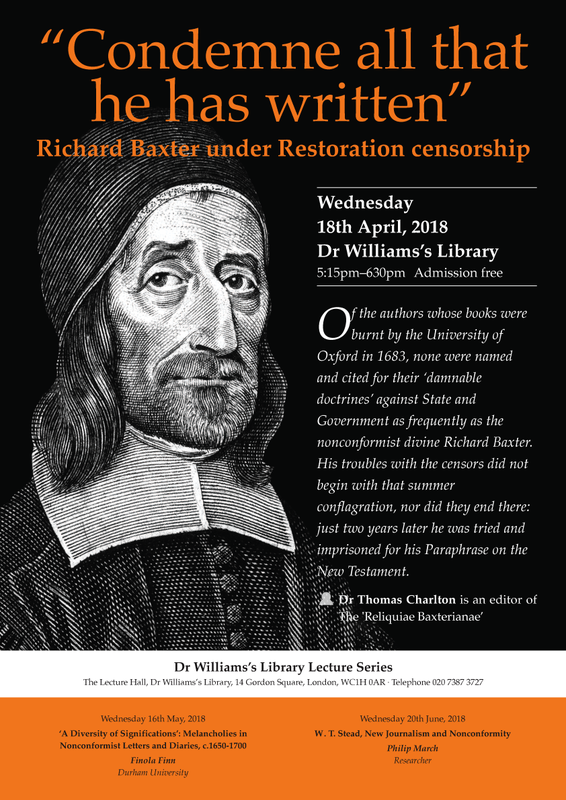 This paper will explore why Baxter’s writings were understood by the Restoration authorities to be so pernicious, how broad the modes of censorship experienced by Baxter could be, and how varied their impact was – from the material (the mechanics of licensing, imprisonment, even contesting wills in the court of Chancery) – to the interpretative and rhetorical arguments at the root of such measures. In the fraught political environment of the late seventeenth century, Baxter was to discover, the explicit meaning of a text was frequently less important than what others might bring it to mean.